I remember in the past that the right click menu gave an option to disable blocking for a page and a slider to adjust the level the domain was blocked at. I'm also remembering something about AdBlock merging or changing ownership. Is that feature gone because of this? Am I thinking of a different AdBlock extension? That feature is still there. If you right-click a web page, the AdBlock item on the menu should show two sub-items, Block this ad and Block an ad on this page (that's the one that has the slider). Is there a page where you aren't seeing this? Hi Rhana, I tried what you said and that was what I was looking for. I thought I remembered doing it from the AdBlock extension button in the top right rather than clicking in the webpage itself. 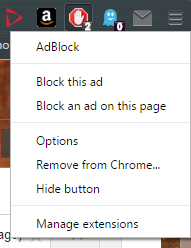 Is there a right click option for me to pause AdBlock on all of my opened webpages? Thanks again. Hi Rhana, thanks again. I don't have that option on my right click menu on the button directly. It was another thing I remembered being right next to the domain filter you directed me to. I'm running Windows 10 64 bit with Google Chrome build 48.0.2564.82 m (64-bit). Yes, it's a little confusing! Maybe this will help. If you remember seeing Pause AdBlock somewhere else, maybe it was in an old version of AdBlock. We are also considering suggestions that others have made to add that option to the right-click menus as well. Wow, thank you for pointing out something incredibly obvious that I missed. Sorry about that. stark.trevor35 closed this discussion on 24 Jan, 2016 08:56 PM.